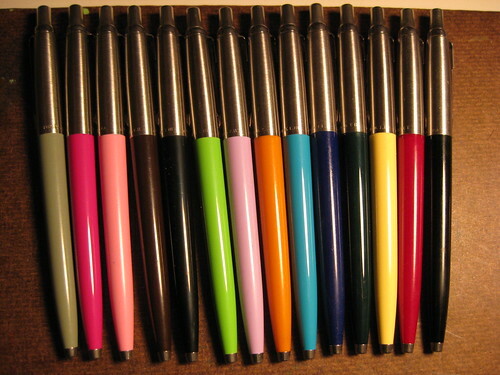 Parker Jotters - My favorite pens since I was 8 years old! There was no love of writing anywhere to be found in me today. Maybe I spent too much of it yesterday, or maybe I was simply too distracted to dig deep enough today to find it. No matter - what counts is that I showed up, pen in hand, and wrote a page and a half anyway. I felt better after I did it, so there was at least something accomplished even if the writing itself sucked. Whenever my writing hits a lull or I feel uninspired, I turn to the system that seems to work for my kids - bribery. No, really! My mind and creativity are not too evolved for the simple satisfaction of a treat now and then, and I certainly hope you don't feel that yours are, either.